We exclusively utilize USA grown. Organic Apples in our chips.We never compromise quality.Organically Farmed Apples - Better for the environmentLocally Grown Apples - Selected at the farm for quality assuranceExclusive Baking Process - To ensure maximum health and tasteHighest Quality Packaging - To ensure a crunchy experience100% Organic Apples (baked into crunchy chips)Get Healthy!No Added SugarNo PreservativesFat FreeGluten FreeNon GMOOrganicNo Cholesterol0 g Trans FatGood Source of Dietary FiberDiets low in saturated fat and cholesterol, and as low as possible in trans fat, may reduce the risk of heart disease.Get Organic!Eating fruit just got easier! 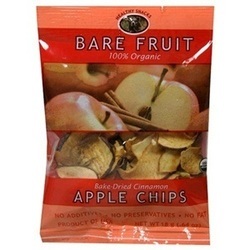 barefruit apple chips are a delicious snack you can take anywhere. When you and your family are trying to eat healthy, reach for delicious, crunchy goodness - reach for barefruit.Get Cinnamon!Because we bare it all, right down to the core. Using no preservatives, adding no sugar, never frying or freeze drying, we offer apples in a way you have never tried before - but will absolutely love.